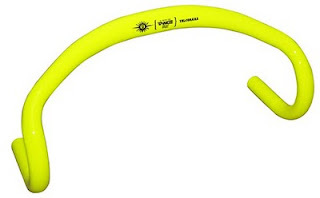 We did up a couple of 38cm width versions of our Tange CrMo 31.8mm Velodrama bar, one in bright red, the other in neon yellow. Find em here. 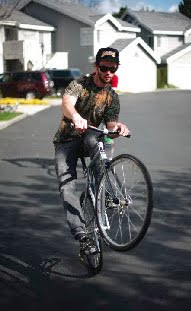 Chris Fonseca, creator of the incredible "No Cassettes" fixed gear freestyle film has got his website up. The film features a host of talented riders pushing their bikes to the limit, including Jason Clary, who's been helping us test new products. You fans of our 5mm thick treaded, long lasting Everwears asked for it. Available now in black or colored stripes. • 7,507lbs of food for the San Francisco Food Bank. 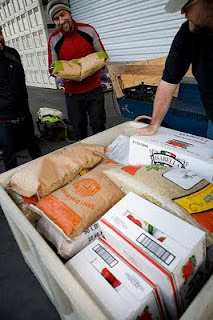 7,507lbs of food is the equivalent of more than 6,000 meals! Photos courtesy of Jonathan Koshi. 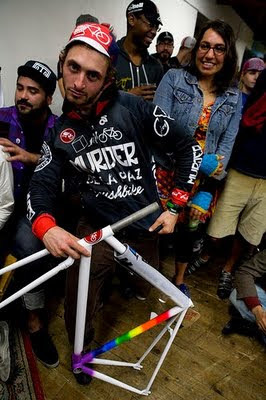 Adam Shapiro was the speed demon of the day and won our custom Rush frame. 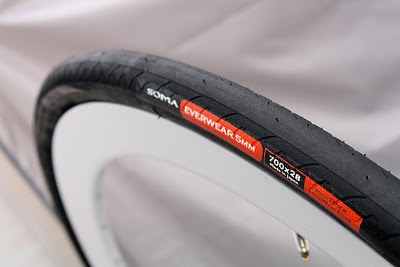 Here's another chance to win a Soma frame! If you live in the Bay Area or will be in SF this weekend, take part in the 4th annual Super Market Street Sweep benefitting the SF Food Bank. 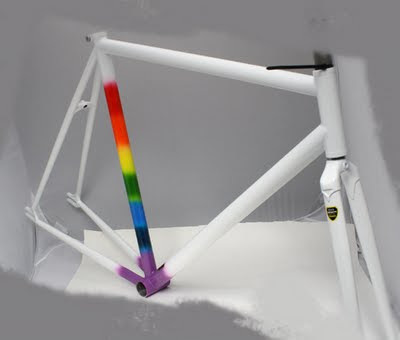 The frame we have donated is a never been built prototype of our 2010 Rush painted in a tie dye rainbow scheme. Production frames will not come in this color, so this is truly a one of a kind prize. Includes a matching straight blade fork. There will be a ton of other prizes up for grabs, too. 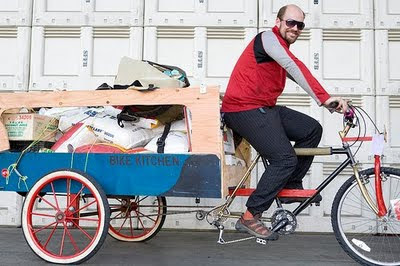 Last year's participants brought in over 5000lbs of food! The event begins at the Bow & Arrow on Embarcadero this Saturday at noon. C'mon out and help make this the most successful Sweep ever. The 2010 Rush uses Tange Prestige heated treated CrMo tubing and features new Tange track ends and zero bottle bosses for the first time (for those with bottle boss allergies). Production colors will be white and khaki green. First shipment ETA is some time in February. If you read our blog regularly, we have outfitted Bryan and Joaquin (collectively known as "We Keep Going") with a couple of our Saga touring frames for an extended tour into South America and beyond. 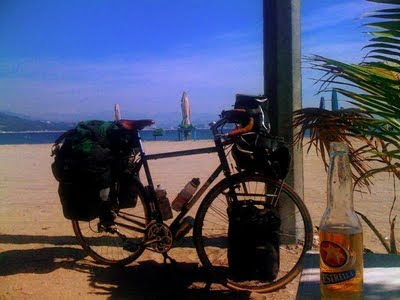 Even though they are living a simple cyclo-touring lifestyle, they still need dinero to buy supplies and food on their long journey. They are holding a raffle to raise these funds. For every $10 donation you make, you get an entry to their raffle. Why should you help these guys live their postcard life? Holiday good will? Karma ? 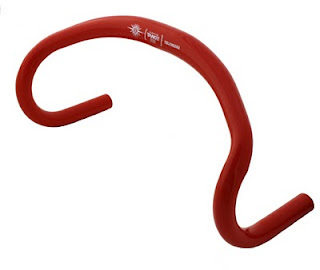 Or maybe the chance to win a new Soma frame and fork of your choice? Winner to be drawn in a few weeks, so donate soon. 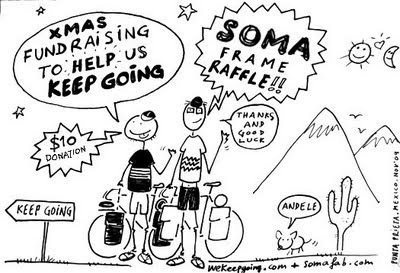 Disclosure: Soma Fabrications is not involved in planning or running this raffle. This post is just a favor to our friends and not an official promotion for Soma. Any questions should be directed to We Keep Going. Club Santiago, La Boquita: Damn, wish we were there. Photos courtesy of We Keep Going.